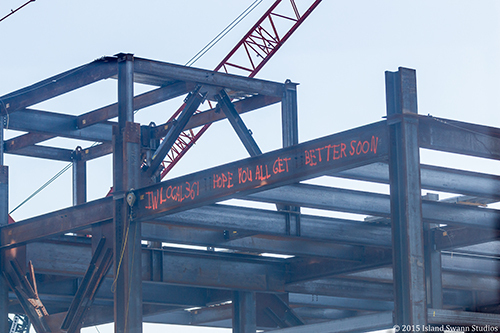 In 2015, ironworkers from local 361 tagged a steel beam in orange paint with the message, “IW 361, Hope you all feel better soon.” Suspended by a crane, the beam was lowered into place in what is the new Stony Brook Children’s Hospital building. 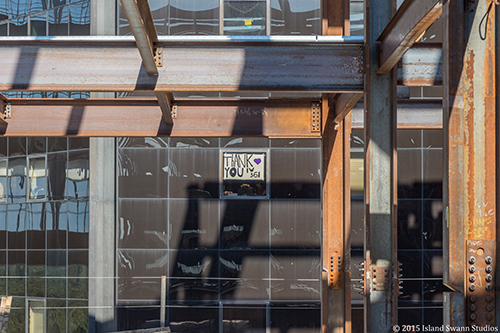 Not long after, a paper sign scrawled in crayon appeared in one of the patient’s windows with a reply: “Thank you, IW 361.” The brief back and forth between patients and on-site construction workers culminated in five area labor unions contributing a generous donation towards the new building. Ironworkers Local 361 gave $100,000 while Plumbers Local 200, Electrical Local 25, Operating Engineers Local 138 and Steamfitters Local 638 each donated $50,000. 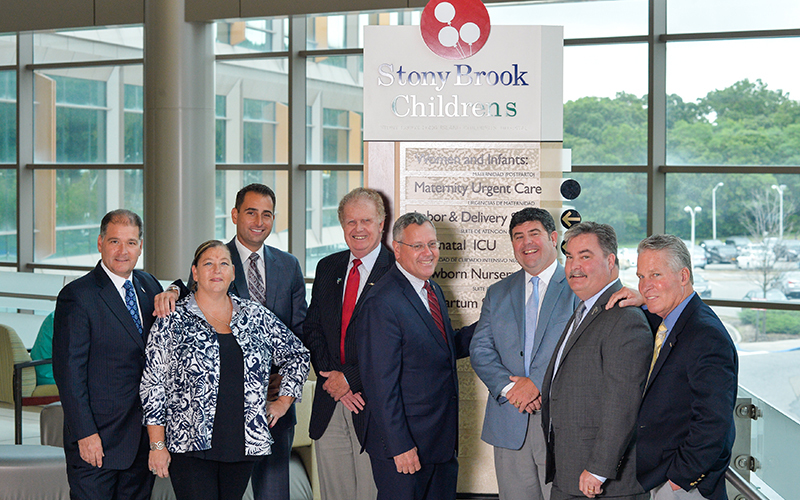 Thanks to matching dollars from the Knapp Swezey Children’s Challenge, the five unions have made a total impact of $600,000 on the new Stony Brook Children’s Hospital. Matt Chartrand, business manager for Ironworkers Local 361, knows of many on his team who have children who have visited the hospital and can speak firsthand on the expertise within. “It’s one of the best places you can walk into,” he said. Stony Brook Children’s first launched in 2010 and currently boasts 180 top pediatric physicians, 250 pediatric nurses, child life specialists and social workers and cares for more than 8,000 inpatients and performs more than 3,700 surgeries each year. The $72 million 71,500-foot children’s hospital expansion will be housed in the 10-story Hospital Pavilion. It will feature 108 single patient rooms, including the pediatric intensive care unit and pediatric medical surgical beds, family amenities, playrooms, teen spaces and more. From trauma to state-of-the-art cancer treatment, Stony Brook Children’s will have a greater ability to handle any type of medical condition affecting kids. The unions’ collective gifts all contributed to The Campaign for Stony Brook’s $600 million goal, the largest in SUNY history. To date, more than 38,600 donors have given more than $512 million in support of areas across campus.